UPDATE Oct. 20, 2017: The Bureau of Land Management and Russ Feller, the current owner of the mining rights to the “Glitter Mountain” mine, want the public to know the site is not abandoned, but is active and mined by Feller Stone. Due to a misunderstanding of the mine’s nature perpetuated by the internet in recent years, the BLM and Feller have begun to reach out to media in order to correct the misinformation. Feller told St. George News that he does not mind people taking a few pounds of selenite crystal from the site – 2 inches and smaller only – he asks visitors respect his claim to the site and not take large pieces his company otherwise mines and sells. The BLM has recently set up a pair of signs at the Glitter Mountain site with a list of visitor guidelines and geological data related to the site. Digging and mining tools are prohibited. This includes hammers, picks, shovels, machinery, etc. For your safety, do not go near or in the mine’s pit. Please help keep the site free of trash. For your safety and the safety of others, do not shoot near the mine. Please visit this site safely and responsibly and be respectful of this mining claim. For more information contact the BLM Arizona Strip Field Office at 435-688-3200 or Feller Stone 435-574-9300. FEATURE — In this flashback episode of the “No Filter Show” co-hosts Paul Ford and Grady Sinclair head south of St. George to a mound that sparkles. Pure selenite is transparent and colorless, or very lightly colored, and easily splits into sheets. It is a variety of gypsum that forms in distinct crystals. Though it may appear to be a hill of broken glass, Sparkle Mountain is a mineral deposit. There are no mine shafts there today – just gouges in the hillside where the glittery mineral has been dug out. This particular deposit is referred to locally by a variety of names, including the old mica mine and Sparkle Mountain. Selenite can easily be mistaken for mica but the two are are not the same. 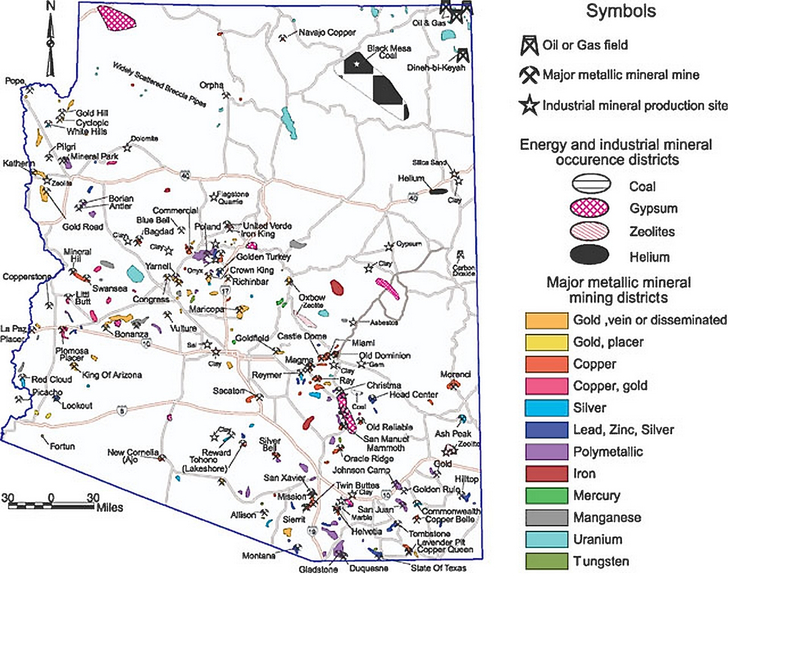 The Arizona Geological Survey’s Mineral Resource Map (see inset) designates this deposit as gypsum. Designations vary and an evaluation of the minerals in this area is beyond the scope of this “No Filter” feature. Perhaps the brightest note in this feature is that kids really love this place. It’s quick and fun for family night or a Saturday excursion. Bring water and a few snacks. Gloves are nice to have for the adventure but not particularly necessary. Small buckets will come in handy for collecting some glitter. The mine is easily accessible and four-wheel drive is not required. 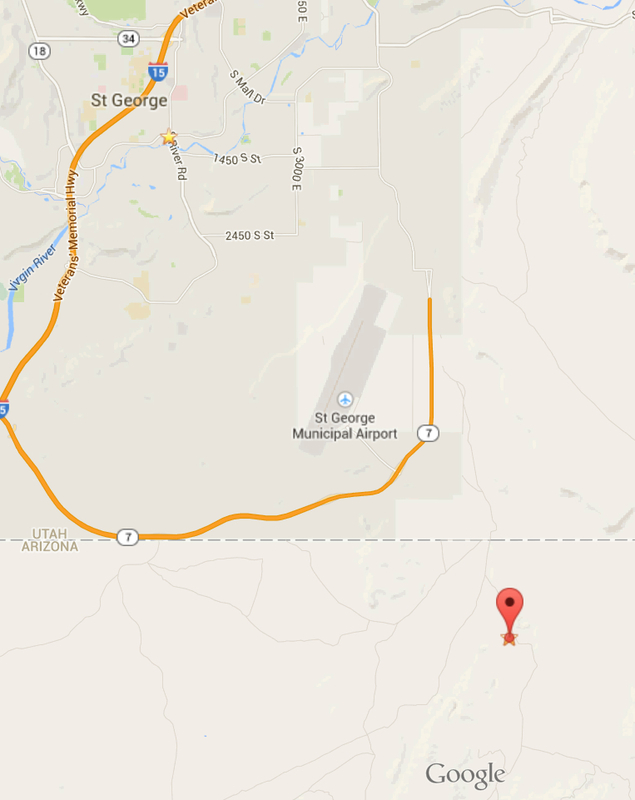 Driving time is about 20 to 25 minutes from St. George. From the Walmart in Washington, 625 W. Telegraph Street, head east on Telegraph Street. Turn south on Washington Fields Road. When you reach Southern Parkway, you are about 10 miles away. Head south on the dirt road (this takes you to the Arizona Strip). You will pass some houses at the Utah and Arizona border. When you see the houses, continue south. Drive another 1.6 miles and you will see Sparkle Mountain on the right side (to the west). I’d rather get tazed by a cop than ride a bull. And, I miss Stinky Stanley.